Last Thursday was sizzling with Garden Chef Christina Curry for Cocktails in the Garden. Fresh garden mint was used to add a refreshing taste to tzatziki sauce served over grilled chicken sliders. A tip for tzatziki is to remove the seeds from the cucumber before adding it to the sauce. You could also replace part of the Greek yogurt with sour cream or feta cheese. On a rainy day you could sauté the sliders instead of grilling them. All white meat chicken sliders would work too; just add a little more Worcestershire and cheese for moisture. Give this one a try and let us know how it turned out. Enjoy! In a medium bowl, combine the ground chicken, cumin, mint, dill, red onion, feta, Worcestershire, lemon zest, salt and pepper. Mix until all ingredients are incorporated. Form into 3 ounce patties and grill, sauté, or broil until cooked through. Serve on your favorite mini bun with tzatziki sauce, lettuce and tomato. Explore more Garden Chef recipes. For the third time this month, Garden Chef Christina Curry was challenged to feature fennel. She’s already braised it and used it in salad and slaw. What’s next? Crispy fried fennel with an herb aioli sauce! Chef Christina harvested fennel and mint from the Edible Garden. She prepared a light batter for the shaved fennel using milk and then dusted the fennel in a mixture of flour and cornstarch. She added cornstarch for extra crispiness and then removed the excess by shaking the fennel in a colander. A tangy herb aioli with equal amounts of mayonnaise and Greek yogurt was the perfect topping. As a side tip for those watching their sodium, she suggested using lemon as a flavor enhancer. Enjoy! Place the fennel in a medium size bowl and cover with milk. In a large freezer bag or paper bag, combine the flour, cornstarch, 1 tablespoon salt and 2 tsp pepper. Remove the fennel from the bowl and place in the flour bag. Close the bag and shake until all of the fennel is coated. Shake off the excess flour mix and fry until crispy. Remove from the oil and place directly on a paper towel. Season with additional salt immediately. Serve with Herb Aioli. Place all ingredients in a blender or food processor and blend until smooth. To prepare by hand, finely chop the garlic, parsley, and mint. In a bowl, whisk together the mayo, yogurt and lemon juice. Add the chopped ingredients and season with salt and pepper. Discover more Garden Chef recipes. Garden Chef Christina Curry wowed the crowd this past Thursday with her demonstration and tasting at Cocktails in the Garden. Grilled steak was paired with a light salsa made from juicy summer tomatoes, lime juice, cilantro and onion. Here are a few great tips for creating marinades. For extra flavor and smokiness add cumin and smoked paprika. When pureeing the marinade, for soft stemmed herbs like cilantro and flat leaf parsley, save time and throw in stems and all. Remove the stems for harder stemmed herbs like rosemary and oregano since they tend to be bitter. Avoid throwing super cold meat on a hot grill, so let that marinade do its magic at room temperature for about 20 minutes before grilling. Is your mouth watering yet? Hold that knife…let the meat rest for a few minutes before enjoying. You’ll be rewarded by a more tender and juicy bite. We hope you’re inspired to fire up that grill and enjoy this easy summer supper. Pairs well with cocktails and salsa music! In a blender or food processor, combine the chili powder, cumin, garlic, 1/2 bunch cilantro, red wine vinegar, 1/2 cup olive oil, 2 teaspoons salt and 1 teaspoon pepper. Blend until smooth and pour over the skirt steak. Marinate for at least 20 minutes before grilling over medium-high heat to desired temperature. In a medium bowl, toss together the diced tomato, green onion, red onion, lime juice, 2 tablespoons chopped cilantro, a touch of olive oil, and salt to taste. Serve sliced skirt steak with salsa. Add tortilla chips for some crunch. Find more Garden Chef recipes here. Swiss chard harvested from the Edible Garden was the inspiration for this Mother’s Day Weekend of Garden Chef cooking demonstrations. Fresh tomatoes were combined with spring lettuce mix, fresh basil and cooked bulgar to create a tasty salad. A tip for cooking bulgar is to salt the water for added flavor in the finished dish. Chef Christina recommends seasoning greens after they have wilted. In doing so, the final dish won’t be over-seasoned since most greens wilt down considerably. The salad was topped with grilled salmon prepared with herbs from the Edible Garden. Enjoy! Trim any thick or tough stems, wash and roughly chop the Swiss chard. In a large sauté pan, heat 2 T of grapeseed oil over medium high heat. Add the chopped shallots and Swiss chard and cook for 1 to 2 minutes. Season with salt and pepper and remove from the heat. In a mixing bowl, combine the bulgur, basil, tomato, spring mix and the wilted Swiss chard and mix gently. Add the lemon juice, vinegar, and olive oil. Toss, taste and adjust seasoning as needed. Check out all of the Garden Chef recipes. Many fennel parts are edible, including the feathery leaves, dried fruits, and bulb. The first weekend in May, Garden Chef Christina Curry demonstrated the use of the bulbs in a fabulous Mixed Greens & Fennel Salad. For those that want to get a head start on the meal, soak shaved fennel in water with lemon juice to prevent browning (oxidation) and preserve the beautiful white color of the bulb. Fennel parts have a licorice flavor that pairs well with citrus and are perfect for salads. Fronds can be used like herbs to add color and taste to your finished dish. Although they look like dill, fennel fronds have an aroma and flavor all their own. When selecting citrus from the market, use softer lemons for juicing and look for the brightest colored lemons for zesting. Enjoy this refreshing summer salad that highlights the bright flavor of fennel! In a large bowl, combine the mixed greens and shaved fennel. In a small bowl, combine the olive oil, lemon juice, orange juice, shallot, honey and season with salt and pepper. Whisk together and immediately pour over the mixed greens and fennel and toss gently. During Cocktails in the Garden on Thursday, May 10, Atlanta Botanical Garden Chef Christina Curry prepared Spiced Ground Chicken with a slaw featuring fennel from the Edible Garden. Fennel, Napa cabbage and julienne carrots were dressed with ponzu, soy sauce, mirin and rice wine vinegar for an Asian-style slaw. Ponzu and soy both contain sodium so the slaw will need less seasoning than usual. Ground chicken is flavored with garlic and ginger and other sweet sauces for this quick anytime meal. To finish the dish, Chef Christina wrapped the spiced chicken in a grilled tortilla and topped the dish with the slaw. Combine all ingredients and gently toss together. Season with salt and pepper as needed. In a large skillet, heat 3 T of grapeseed oil and 1 T of sesame oil over medium high heat. Add the chopped ginger and chopped garlic and cook for 1 minute. Add the ground chicken, chili garlic sauce, soy sauce, and sweet chili sauce. Stir ingredients together and cook for 5-7 minutes or until the chicken is cooked through. Remove from heat, add the green onion and cilantro and adjust seasoning as needed. Top Spiced Ground Chicken with Fennel & Napa Cabbage Slaw in a tortilla or a bowl. Enjoy more Garden Chef recipes here. Thursday, May 3 was the debut of the Garden Chef Cooking Demonstrations at Cocktails in the Garden. Now visitors have more opportunities to catch a Garden Chef Demo including Thursday nights from 7 – 9 p.m. and weekends at noon, 1 p.m., and 2 p.m.
A tip for squeezing lemons, use one hand as a strainer to catch the seeds. Our very own Garden Chef Christina Curry selected herbs from the herb wall to pair with grilled salmon, fresh spinach, kale and orzo. 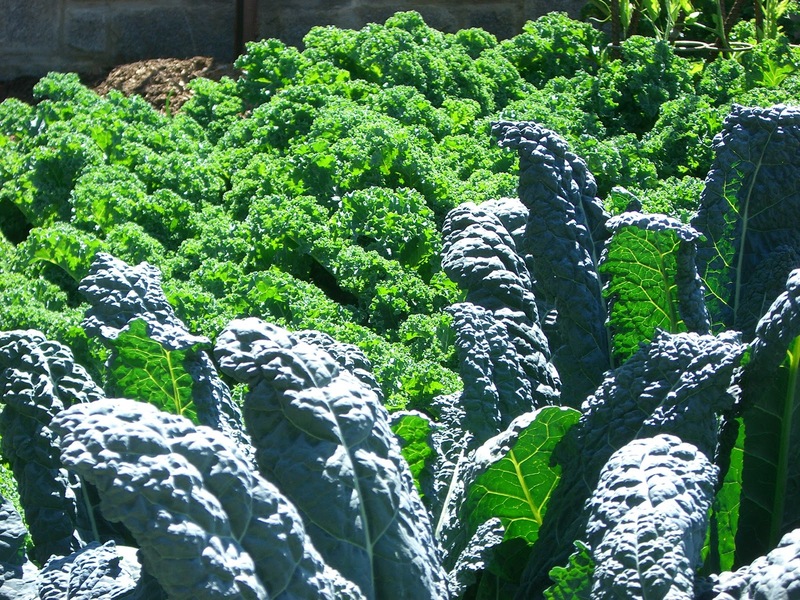 Kale is a great source of vitamin A and C. Check out other recipes on the blog and the Garden Chef webpage for fun ways to use kale, including kale chips! After partially cooking the side of salmon on the grill, Chef Cristina covered the fish with lemon slices and herbs, wrapped it in foil, and placed it back on the grill to finish cooking. Chef Cristina finished the orzo with cranberries for a wonderful sweet and tart flavor. Pine nuts would also be a great pairing. Enjoy! Heat grapeseed oil in a large sauté pan over medium high heat. Add the shallots and cook for 30 seconds. Add the spinach, Swiss chard, kale, and season with salt and pepper. Cook for about 2 minutes and remove from the heat. Continue to stir so the vegetables cook evenly. Add the orzo pasta, lemon juice, lemon zest, cranberries, and fresh parsley and toss gently. Taste and adjust seasoning as needed. Serve with grilled, seared or baked salmon. Discover more Garden Chef recipes here. Showcasing the farm-to-table concept of cultivating and consuming fresh, local and sustainably-grown food, the Edible Garden project not only returns the 1-acre asphalt parking lot to green space but also demonstrates that fruits and vegetables make beautiful landscape plants. The garden includes an Outdoor Kitchen where Atlanta's top chefs will present cooking demonstrations using garden ingredients. 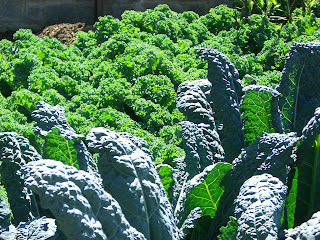 On weekends, the Garden Chef demonstrates seasonal recipes using ingredients harvested straight from the Edible Garden. And, as for those leftovers go, any food not used in educational programs will be donated to local charities.